AngularJS directives of Foundation | Eureka! 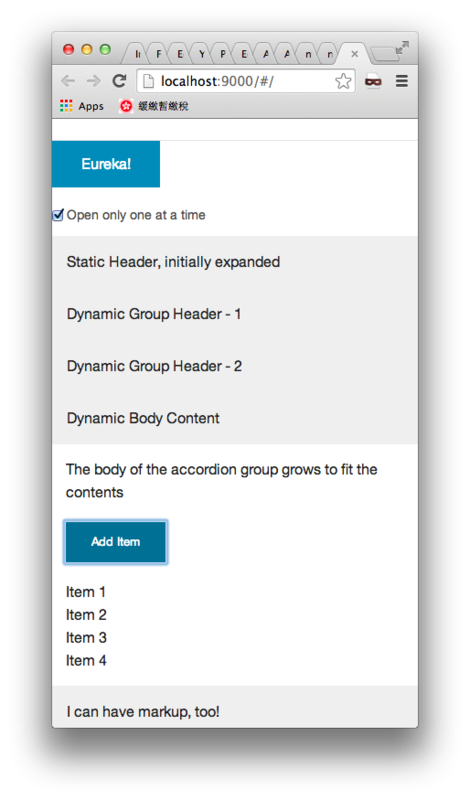 We got the Foundation 5 with Sass styling working on our AngularJS project which was scaffolded by Yeoman. Let’s continue our ng-foundation example above. To utilize the Foundation framework in a more effective way, the Mad Mimi team creates some native AngularJS directives based on Foundation‘s markup and CSS which is available on Bower. 1. Edit the bower.json to specify the angular-foundation dependency. 2. Install the angular-foundation to your project. 3. Edit the ./app/scripts/app.js to include the angular-foundation module. 4. Let’s try to add the Foundation accordion. Edit the ./ng-foundation/app/views/main.html as follow. This content is straight in the template. This is just some content to illustrate fancy headings. content: "Dynamic Group Body - 1"
content: "Dynamic Group Body - 2"
6. Start the application and verify if the accordion is working. 7. Make sure you have included the angular-foundation in the karma.conf.js, otherwise all unit test cases will be failed. Pingback: Yeoman – Setup AngularJS and Foundation 5 with Sass | Eureka! Thank you for this guide. It helped me alot. My-self Aswini,I am working with angularjs with mm-foundation please give me the detailed explanation about mm-foundation like mm.foundation.tpls,mm.foundation.accrodian why we are config in our module of application and one more thing and how these are working in my app. some one using .html files i coudn’t find these file path any where in my app.So some one please help me out in this. You could find more details from their website.